• Kuwaiti Arabs comprise 45 percent (approximately 950,000) of the population in Kuwait. “Arab” is a name originally given to the nomadic inhabitants of the Arabian Peninsula. It is now largely a cultural/linguistic designation, embracing various national, regional, and religious groups in several different countries. • Kuwaiti Arabs tend to be dark-haired with brown eyes, and olive or dark skin. However, no single set of racial or physical characteristics defines Kuwaiti Arabs. Due to centuries of migration and contact with other groups, Kuwaitis can exhibit Persian, Turkish, Indian, African, and South Asian features. • Kuwaiti Arabs are predominantly Muslim. They are divided between Sunni (approximately 70 percent) and Shia (approximately 30 percent). The Sunni-Shia division has caused fewer problems in Kuwait than in neighboring states. For the most part, it has not undermined a sense of shared Kuwaiti Arab identity. • Kuwait is essentially a city-state. The majority of people live in Kuwait City, which has grown from a small sea-town into a modern, cosmopolitan city. There are smaller communities inland and to the south along the Gulf coast. • Kuwaiti Arabs trace their lineage to the Bani Utub tribe, which settled Kuwait in 1716. The journey to Kuwait established a strong sense of community and gave Kuwaitis the origins of a national identity. • Although Kuwaiti identity remains influenced by their nomadic heritage, Kuwaitis have been essentially settled for nearly 300 years. A center for maritime and desert trade, Kuwait was linked to the Arabian Peninsula, the Gulf, and India. • Kuwaiti Arabs speak Arabic. Most Kuwaitis also speak English. The Arabic language embodies an entire culture that links Kuwaiti and Islamic identity. • Kuwait is not a colonial society created in the wake of European conquest. Its long history of cultural and political autonomy has produced a distinct national identity. However, divisions cut across Kuwaiti society, including those along class, tribal, religious, and gender lines. • Since the mid-18th Century, members of the Al Sabah family have ruled Kuwait. Until the oil boom of the mid-20th Century, Kuwait’s merchant elite wielded substantial political power and influence. Although the ruling family has assumed the identity of royalty, the consultative nature of politics in pre-oil Kuwait continues to inform Kuwaiti perceptions of authority and power. • Kuwaiti history and identity can be divided into pre-oil and post-oil periods. Since the discovery of oil in the mid-20th Century, Kuwait has experienced a radical but relatively smooth transition from poverty to prosperity. The visible and material effects of the oil boom on Kuwait have included: the rapid improvement of living standards, massive infrastructure development, generous welfare-state provisions, a huge influx of immigrant labor (skilled and unskilled), and the adoption of a Western, consumer-oriented lifestyle. • Since late 1950s, Arab and Asian foreign workers have outnumbered Kuwaitis. Economically dependent on foreign labor, Kuwait has constructed a complex set of policies for the control and exclusion of migrants. The native Kuwaiti has almost complete authority over the foreign worker. Kuwaitis contrast their affluence, leisure, and power to foreing workers’ economic need, labor, and dependence. • Kuwaiti citizenship—which is limited to Kuwaiti Arabs meeting certain conditions, and is strictly regulated—implies belonging to an elite society and enjoying privileges not accorded to foreign workers. 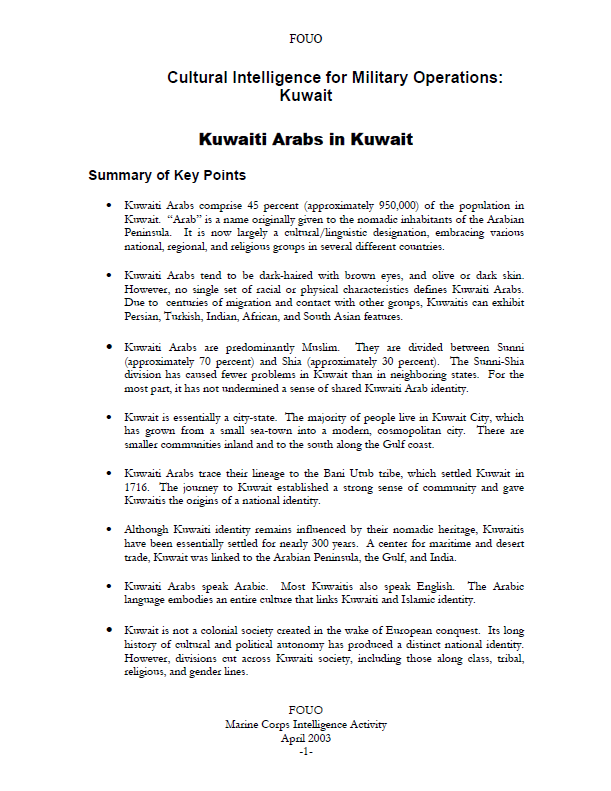 As a result, Kuwait is a society strictly stratified in terms of ethnicity and class. • The 1990 Iraqi invasion and occupation of Kuwait had profound consequences for Kuwait. Nearly 60 percent of the population fled. Following the war, the government restricted the immigration of nationals of those countries that collaborated with or supported Iraq—such as the Palestinians and Jordanians—while giving preference to the nationals of those states that supported Kuwait. • Kuwaitis had long unified against external danger, and the Iraqi invasion and occupation strengthened Kuwaiti national identity. Similarly, the Battle of Jahrah in 1920 established Kuwait’s independence from Saudi Arabia and reinforced the city-state’s national identity. • Kuwaitis tend to be highly educated, have traveled extensively abroad, and have a Western-oriented lifestyle. At the same time, Kuwaiti society and culture remains conservative, valuing local tribal and Islamic traditions. • Concerns over cultural survival have grown with the increasingly cultural diversity of the population. In their attempts to shield themselves from alien influence and protect their national privileges, Kuwaitis have maintained and refined those characteristics that serve as marks of national identity.